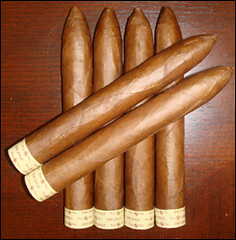 This review is of the smallest cigar of the line – the 5 inches by 48 ring gauge “Missile” figurado. The line also features Toro and Torpedo sized cigars, both measuring 6 inches by 52. The Missile is usually available for about five dollars or less per stick when bought individually. This particular stogie features a rough corojo wrapper with an oily sheen and a few bumpy veins. Pre-light, earthy chocolate notes were apparent. Overall I think the classic “naked” look is nice and, while I haven’t yet seen the new “banded” edge in person, I’m inclined to think that change is unwarranted and possibly even a negative. Given the reputation and marketing campaign trumpeting the edge’s full flavor, I chose a strong drink to accompany this cigar – a Dewar’s White Label Scotch on the rocks. Upon lighting the cigar honey, spice, and earth flavors came through strong and clear. Additionally, a bit of cream was noticeable. The ligero tobacco was prominent, but I would still classify this as a well-balanced smoke. The draw was a bit firm and the smoke was not particularly dense, but the burn was perfectly even and the packed ash was a salt-and-pepper gray. Further into the cigar the honey and cream faded and some distinctly black pepper spice came through. Additionally, some muted herbal notes revealed themselves. At this point I would describe the cigar as having a “quintessential corojo” flavor profile. In the end the Rocky Patel Missile Corojo was tasty if not overpowering. Still it did warrant a stiff drink as accompaniment – I’d leave beer in the fridge for this one. (For a really “weak in the knees smoke” I would recommend the Joya De Nicuragua 1970.) Corojo lovers will be very pleased by the combination of above-average construction, balanced flavors, and favorable price, all of which earn this cigar three and 1/2 out of five stogies. I picked one up a while ago at an RP tasting event and kind of let it sit for a while since I was apprehensive about the "ultra robust" label. Finally I figured I would give it a try and I have to say it certainly is full bodied, but not harsh. Far from making you dizzy it kind builds in intensity. It definitely leaves a stink on you. Not one you could hide from the wife. The size is great and I agree- no band gives this stick something special. Nice review. I'd be interested to see how you guys compare The Edge with the JR Alternative to The Edge. Can't say I've tried the JR Alternative for this one. However, I have been told by someone who would know, that besides wrappers and country (Honduras, Nicaragua or DR) the blends in the JR Alt's don't actually change that much. Only the sizes do. Given that, I would suspect that this is similar to other spicy honduran cigars, like a JR punch alternative… which I found to be ok. Interesting note on the JR Alternatives. I think the only alternatives I've tried were their ERDM and like you, I found them to be okay. If I'm at JR and looking for some value sticks, I think the Consuegras are the way to go…. the same price, if not cheaper, and a better smoke than the JR Alternatives. Just smoked the Edge Torpedo on my deck. Very nice burn and easy draw. Other than the black pepper taste, I was a bit disappointed hoping more complex flavors would reveal themselves. I LOVE the oily wrapper and construction of this cigar. I think 3.5 cigars out of 5 is an accurate rating. I've had these cigars.. These are amazing. I like them a lot for some reason. With price less the 7 bucks a stick, these are really good. I don't know why but I just like these. I'd give them 4 and half stogies, lol.